Oh Philly! (wave!) Look what I got my hands on and I’m not giving it baaaack…. 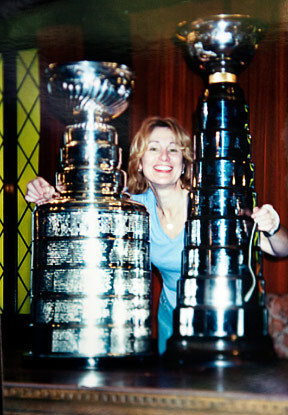 I don’t know why, but just posing with the Stanley Cup made me feel like a master of the universe!! This is a dress from Theory, called NONAH, and its lovely architecture recently caught my eye (and followed me home). This sleeveless dress has a unique shape, with unique combinations of materials and textures– the top portion, made from cupro (similar to tencel) & silk, floats over the almost sheer jersey portion, which is made from modal & triacetate. The drape of the bottom portion of the design had me skeptical (jophurs, anyone?) until I tried it on, and it was unbelievably flattering. It is also has a characteristic that I’ve become intrigued with: Tone-on-Tone coloring. Even though the dress is totally Black, the fabrics it’s made from dye differently and give a subtle variation in color depending on the light source and time of day. But what about those bare arms — what about the recent brutal air conditioning that’s poor little Chicago’s knee-jerk response to +90 overnights? Finished this weekend, with some sleeve seaming, button sewing and a nice bath, this little lace cardi was just the rescue my goose-bumped arms needed this weekend at the Oriental Theatre while in the audience of the Billy Elliot matinee. The cotton blend yarn gives just enough warmth without stifling — the lace (and the buttons) add a little temperature control of their own. For even more fun, I love the look of a cardigan draped over the shoulders and this works nicely!